InLoox offers four different default e-mail templates (project request, project launch, project status and project conclusion). Those default templates can be edited by an InLoox admin in the InLoox options. The admin can also create individual templates (administrator permission needed!). Click on File and then on InLoox Now Options or InLoox PM Options to open the InLoox options. A new window will open. In the navigation area on the left click on Email Templates >> Templates. An overview to the already existing templates will open. In the overview you can (1) create a new e-mail template, (2) edit existing templates, (3) design e-mail templates, (4) delete existing templates, (5) export templates or (6) import templates. 1. To create a new e-mail template click on New. Define rules for the e-mail fields Recipient, CC Recipient, BCC Recipient and Subject. Therefore, click on Fields and select a field from the dropdown-list like PROJECT_MANAGER. 3. Afterwards click on OK to close the dialogue and save the new template. 4. Now a new window will open (InLoox Report Designer), where you can edit the template individually. How to work with the InLoox Report Designer is explained in the chapter The InLoox Report Designer (The InLoox Report designer features are restricted for e-mail templates and not as extensive as for InLoox reports). When you have finished, click on Apply in the InLoox options to save your changes. For changing the general details (Name, rules) of an e-mail template select the template from the overview and click on Edit. A new window will open, where you can edit the general settings. When you have finished click on OK to close the window. Back in the InLoox options click on Apply to save your changes. For changing the content of an already existing e-mail template select the template from the overview and click on Design. A new window will open (InLoox Report Designer), where you can edit the template content individually. How to work with the InLoox Report Designer is explained in the chapter The InLoox Report Designer (The InLoox Report designer features are restricted for e-mail templates and not as extensive as for InLoox reports). When you have finished, click on Apply in the InLoox options to save your changes. 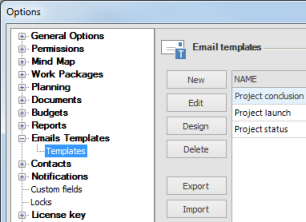 To permanently delete an e-mail template select the template from the overview and click on Delete. Afterwards click on Apply in the InLoox options, to save your changes. For saving e-mail templates on your computer locally, select a template from the overview and click on Export. Afterwards select the storage location and click on Save. When you have finished, click on Apply to save your changes. For importing e-mail templates that are saved locally on your computer, click on Import. A new window will open where you select the template and click on Open. When you have finished, click on Apply to save your changes. Manage e-mail templates in InLoox 9 • Copyright 1999-2019 © InLoox, Inc. All rights reserved.